Didn’t you get the hint yet? I’m always hungry for a taste of retribution with the need to purge. I’ve drowned in my own blood and welcomed the taste until it fueled me to revive. I’m Afon Nikolin, third in command of The Dudnik Circle. The Russian Mob, in case you need a label. The woman I claimed as my future wife, without her knowledge I might add, is part of the Italian mob. She has the same taste for retribution, except she almost paid for it with her own life. Revenge can eat you alive, drag you down until there’s only a shell of a person left, or will cost you everything this world has to offer. With multiple enemies targeting both sides, we have no other choice but to rely on each other. Everything in life is a risk, either with your heart, or your last breath. I’m willing to risk it all when it involves saving her, but will it be enough for the both of us? 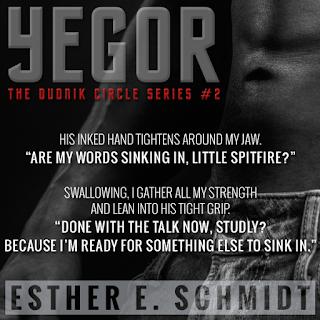 Having read read the first two books in the Dudnik Circle series, I knew that Andy and Afon’s story would be electric. I must say Ms. Schmidt did not disappoint me. I loved this book from the first chapter to the epilogue and the storyline is perfect for this dynamic couple. Andy has been off the grid recuperating from her shoulder injury and plotting her revenge on Marco. 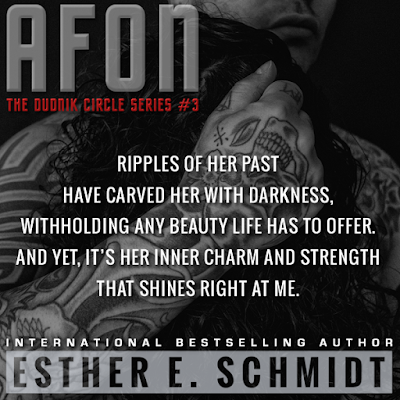 During those months Afon has been patiently waiting for her to surface so he could claim her as his bride. When he finally locates her, she has gone on a killing spree, killing all of Marco’s men. But sadly Marco escapes which means she is still in danger. Afon returns Andy to his own in order to protect her while she finishes healing. While she is there Afon informs her that he has been given her hand in marriage by her brother, Ricca. Andy is livid over that, as she knows she can not be a wife to any man and she doesn’t want to disappoint Afon. You see, due to Incidents in her past, she can not stand to be touched by any man and she’s been totally broken for intimacy of any type. With Marco coming for her and Afon wanting her in ways she can only dream of, what is Andy’s next move? Will she get her revenge on Marco? Once Afon learns the truth about her will he stick around or bail? Is there any way these two can work around the brutal incidents from her past or will they marry in name only? This is one action packed thrilling storyline that will have you saying OMG as events unfold. 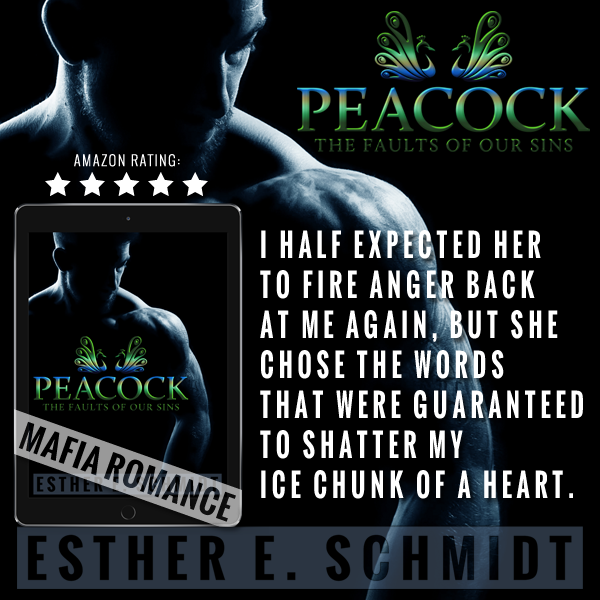 Kudos to Ms. Schmidt for giving us another great book with alpha males and kickass females who are not only tough, but strong, protective and fight for what’s theirs to their dying breath. 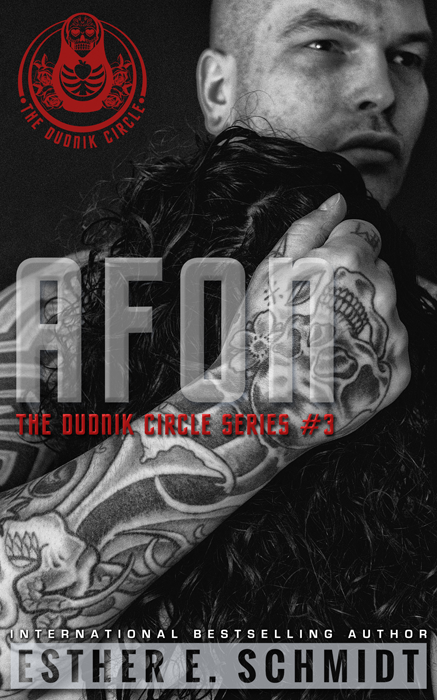 If you like mafia action and no holds barred romance, I highly recommend purchasing Afon and the Dudnik Circle Series. 2 Thumbs Up for an amazing 5 star must read book/series. 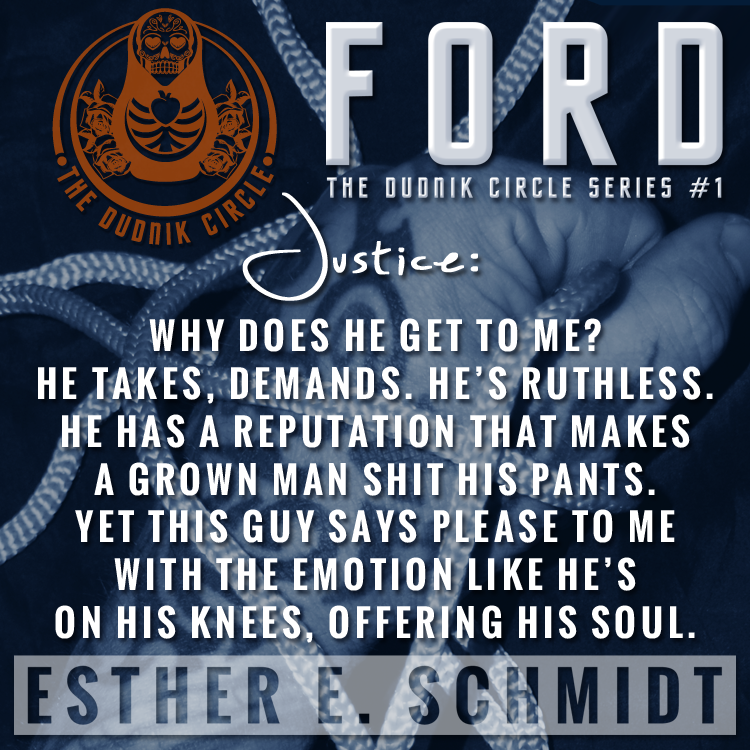 If you want to read a mob book with not only a strong female lead but one that will not only hurt your heart for all that she has been through, but will have your jaw unhinged at what she is capable of doing...READ THIS BOOK! This read is impossibly good and will not only take your breath away but will probably have you rooting for the bad guys for once, because these people are ruthless in their revenge and Andy is one of the worse. 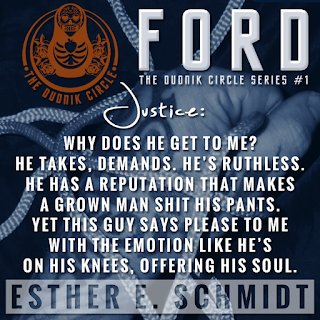 She is set on vengeance against the man who took her. She escaped once and willingly walks into his place with one intention...killing that piece of #$@#! She is in her killzone when Afon enters the place and sees her amongst the death that she has created. She doesn’t “see him” though...she looks at him but he knows...she is still in that zone and he must approach her carefully. 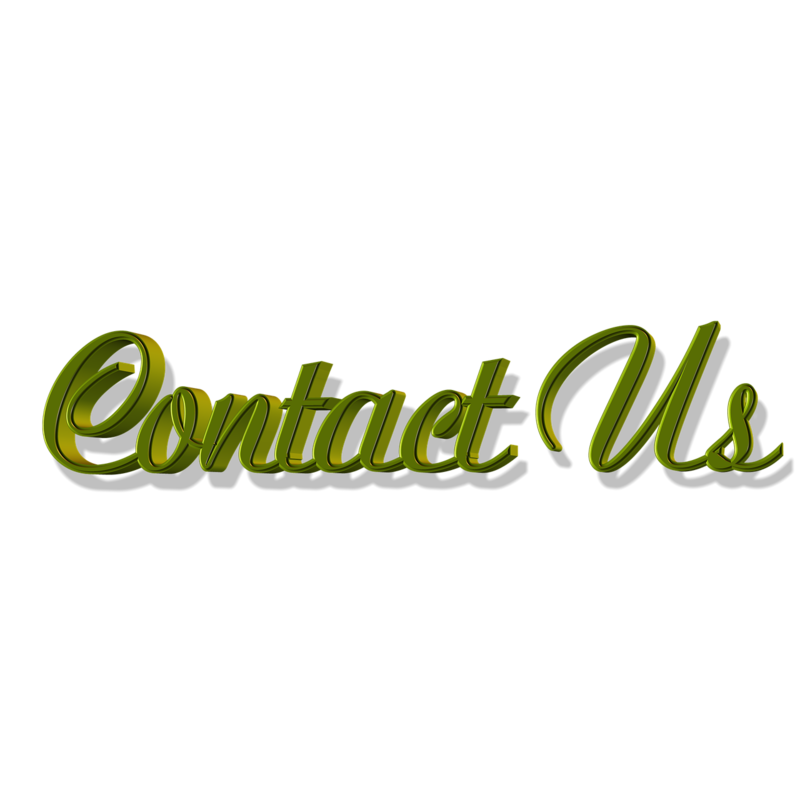 Although he doesn’t escape her totally, he manages to get to he as her physical injuries, mental anguish take hold and adrenaline leaves and she crashes. He brings her to his home where she is tended to and lays in his bed resting. His revelation to her leaves her angry. She is his, he is promised her and he will marry her. He gives her three weeks. One for her wounds to heal and for her to eat and become healthy. Two to regain her strength and her fighting ability. Then they will marry. She is his equal, she is what he wants! Once she has gotten her strength back, he must also help to heal her mentally. 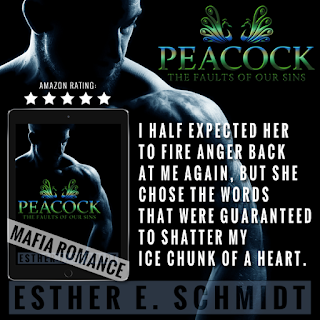 She suffers from panic attacks and he needs to tread very carefully but firmly to bring her mind back to the strength it was before everything that had happened to her. Then and only then will she be able to go after Marco and rid the world of the scum that he is. Then and only then will Afon claim her as his wife. But there is another problem affecting both of the mobs and one that will have them bonding together to rid themselves of this problem. This is an amazing read with incredibly well written and developed characters who will have you wanting to delve into their dangerous lives. 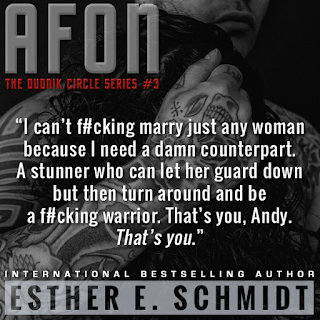 Afon is definitely Alpha Male, but then..Andy is also Alpha Female...but in the bedroom, Andy is the one to submit to the man who will heal her in more ways than one. Andy is strong, beautiful and smart. 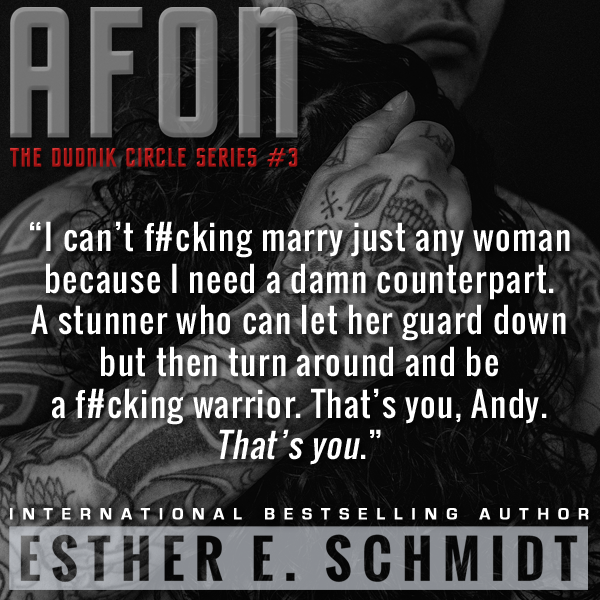 She has lead her own gang for years, but now that her brother has agreed to let Afon have her as his wife, she knows that she will no longer be able to run her own gang and that infuriates her even more than the contract does. When all is said and done, Andy sees the love that Afon has for her and slowly allows the physical attraction that she has for him turn into something much more. An incredible read that will have you turning page after page to see what happens next. I highly recommend this book!!! 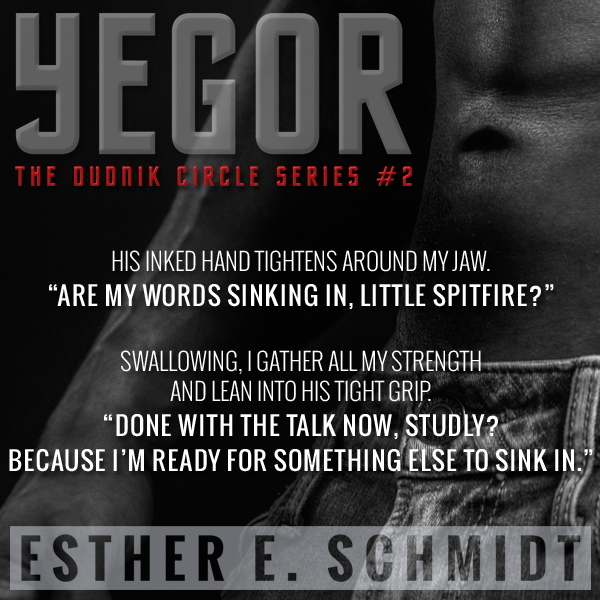 All books in the Dudnik Circle are standalone.